No Salesperson Needed : Executive Leader Coach @ dbkAssociates, Inc.
We — my wife and I — do not make large purchases very often. Recently, however, we found ourselves in the position of having to replace our two aging, high-mileage cars. And we had two very different experiences. One was salesperson-intensive. One was not. In both cases, we knew exactly what car, model, and accessory packages we wanted. The difference is, in one case we had to use a car dealership. It was not particularly unpleasant, it was just tedious and time-consuming. In the second case, not quite a year later, no dealership or salesperson was involved. We replaced my wife’s car first. We knew we wanted to go from a thirteen-year-old hybrid car with about 160 k miles on it to a fully electric vehicle (EV). Not a trade-in, so no haggling over that. After some quick research and talking with colleagues who had also researched and purchase EVs, we went to the appropriate dealer and made a young salesperson very happy. We told him exactly what we wanted in detail. He had the car on the lot, made sure it met our specifications, took us for a test drive and began the paperwork. My wife spent two hours filling out paperwork for a car lease (we decided new technology was best tried out first). Then, of course, there was the DMV paperwork, and phone calls to our insurance company. We drove off in a new car, but not until after being pretty annoyed by the need to sit in a dealership for such an extended period in order to fill out paperwork. The second case was almost identical. But, everything was done online. Another thirteen-year-old hybrid with about 160 k miles. Also no trade-in. There were two big differences this time. Based on our EV experience, we decided to purchase instead of lease, and this time, no dealership was involved. Because we planned on purchasing, I was dreading the loan process. Surprise! I went online to my financial institution, found the personal car loan form, spent maybe twenty minutes filling it out. Then, I was totally surprised that when I submitted the form, the loan was approved right then and there. No salesperson, no delay, no phone conversation — loan approved! Wow. I had heard this was the case but hadn’t experienced the process. Armed with my financing, I went to the car manufacturer’s website, established an account, gave them basic information and configured the car I wanted — again, in detail. All of that took less than 1/2 hour. Once I submitted the configuration form, I immediately got an appointment to go to the delivery location (not a dealership — no salesperson in sight) to pick up the car. Again, no salesperson for either the financing or the car itself. I was told I would be less than a 1/2 hour at the delivery site. I didn’t believe them. I should have. At exactly the appointment time, a nice customer service person took me out to a spotless garage, “introduced” me to my car, and said we needed five minutes to sign four forms. She did not disappoint me. There were four forms, one was a single page DMV form, the others were acceptance of delivery and such. Five minutes because she wanted to explain the forms so I knew what I was signing. We then went to the car and spent 10 minutes of orientation. She showed me the way out of the garage, made a last minute check to make sure the VIN number matched all the paperwork and wished me a good day. I wound up seeing three people, none of them salespeople, during this process. First was the very nice customer service person at my financial institution who handed me the loan proceeds check to take to the car delivery meeting. The second was the customer service person who took about fifteen minutes turning a brand new car over to me. And the third was the insurance underwriter who needed a picture of the new car to put in my file. This last transaction was not like purchasing a new pair of jeans on Amazon. This was a significant purchase. The loan is a significant loan. It was all done online and no salesperson was involved. I see this as the way things should be. It is the way all my reading on automation told me it would be. But until this personal experience, I did not appreciate how far we’ve come and how convenient it was for me. The customer experience has been great. So what are you doing, in your business, to match this kind of experience? Some of my colleagues are hiring great customer service folks and not salespeople. Are you? Technical support folks (rather than sales engineers) are only required after the customer has made a decision. And are you working on making sure you are found when customers are looking for your product or service? Don’t be left behind. 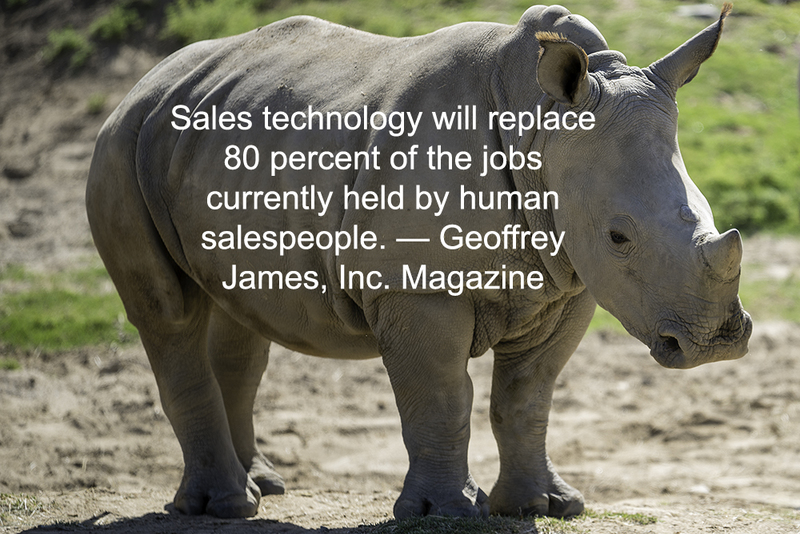 Salespeople are an endangered species.